WikiRobot currently supports the following platforms: MediaWiki, DokuWiki, TWiki, WikkaWiki, MacOS Wiki, TikiWiki and MoinMoin. New platforms are being constantly added. WikiRobot uses local database. That means everything that happens (e.g. when you add sites to a project or create an article) in WikiRobot is stored in the database and stays there until you delete it. 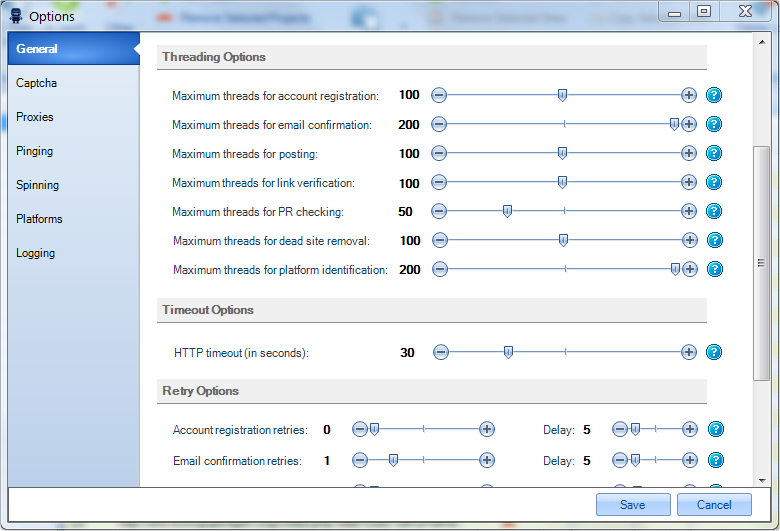 Up to 200 threads can be used for every imaginable action = blazing fast action! For those of you that don't know what threads are: simply said it's like having 200 browsers open doing all the work simultaneously in the background. Anonymous and private HTTP proxies can be used with WikiRobot. 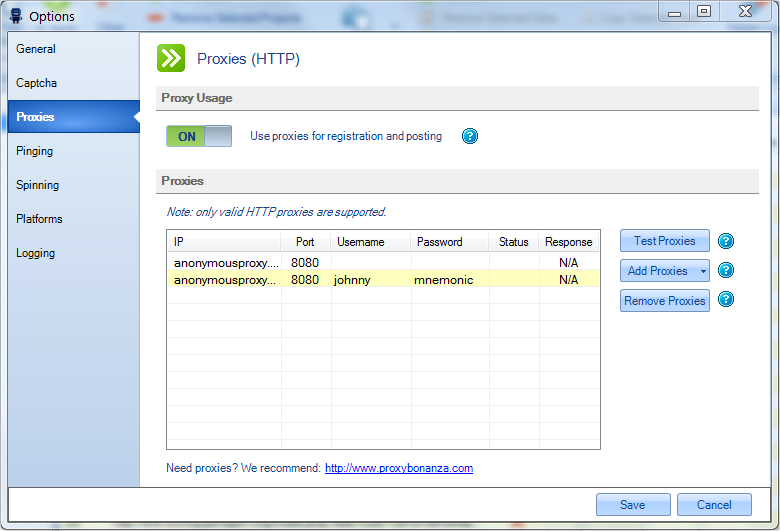 It comes with a handy proxy handling interface that includes checking if proxies are alive, measuring response time, etc. When using proxies, they're always being rotated to prevent unwanted bans. 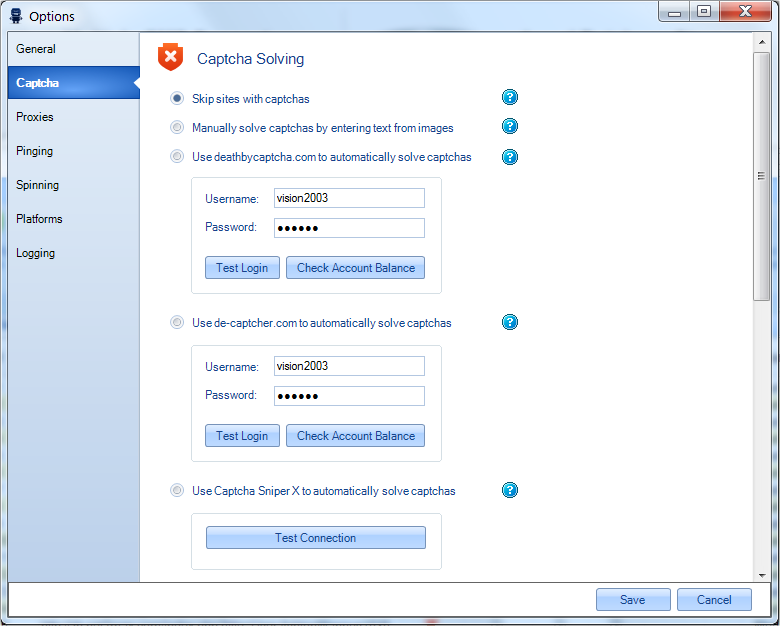 We have built in captcha solving engine, that will solve the simplest captcha types. DeathByCaptcha, De-Captcher, ImageTyperz, GSA Captcha Breaker and Captcha Sniper are also supported. You can also solve captcha manually by entering text from images or answering questions. 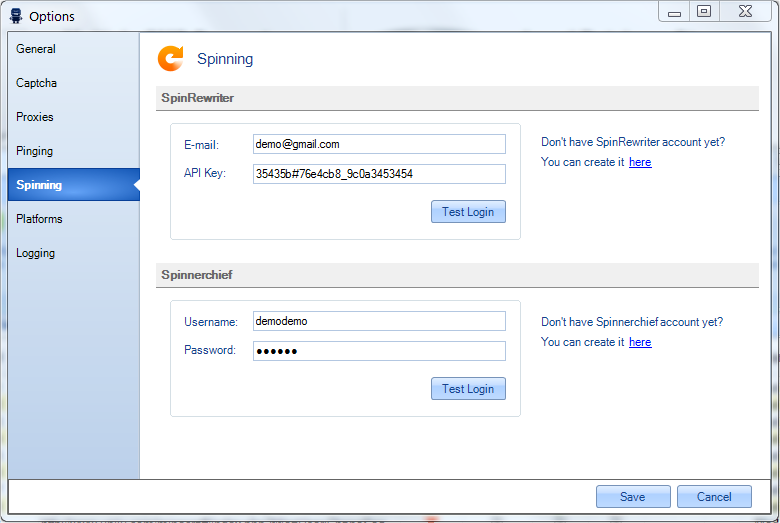 SpinRewriter, SpinnerChief, WordAI and The Best Spinner are supported in WikiRobot. That means all the content rewriting is like a walk in the park - easy and simple. Nested spinning is also supported. Jobs, consisting of tasks (Registration, E-mail Confirmation, Posting, Link Verification) are added through a simple wizard. Each task can: run once (date/time specified by user), or repeat: hourly, daily, weekly, monthly. 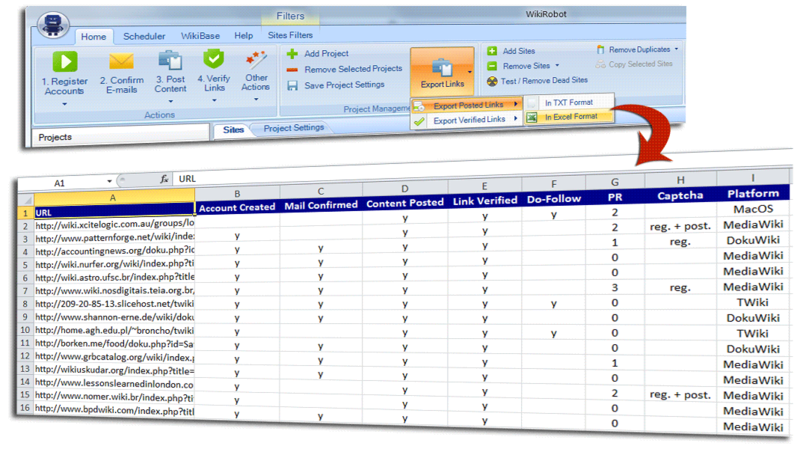 Number of sites can be specified for each task. Tasks can be chained (with delay). WikiBase is a huge database of working and postable wiki sites that is constantly being refreshed and monitored. There are literally thousands of working sites available in WikiBase. WikiRobot comes with a built in pinger, so your link building efforts won't go unnoticed. We have also integrated with Indexification, Linklicious and LinkPipeline which will do wonders to your links. WikiRobot can export both only posted or also already verified links. It can export them in a simple TXT file or in a much more in-depth Excel format (that includes site's platform, PR, do-follow status, etc.). Ideal for those that sell wiki services or anyone else that just wants a pretty report. Posted articles can easily be checked for link presence. You can also easily export only live links. Sometimes everything doesn't go according to the plan. There can be lots of reasons for failure and with WikiRobot you'll always know what's wrong. Every action and result can be logged and reviewed at a later time. 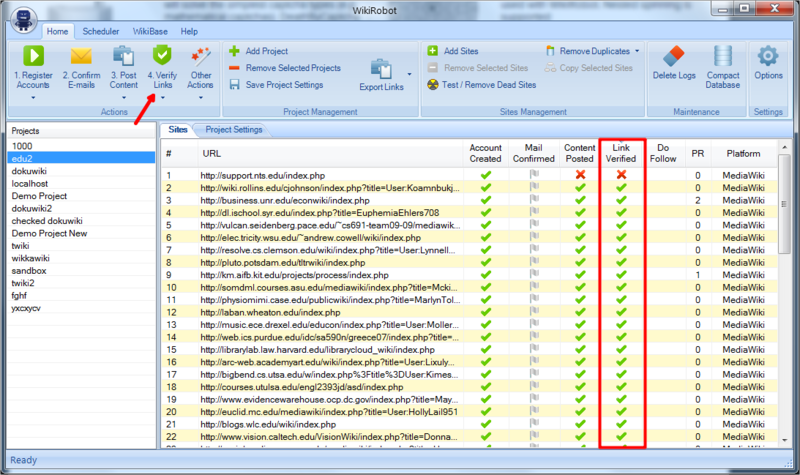 You can easily filter individual project and WikiBase sites to target exactly the ones you want. Some of the filters include: Do-Follow filter, PageRank filter, Captcha Filter, Platform Filter, .edu & .gov Filter, etc. We all know that sites in a "bad neighbourhood" can have a negative impact on your rankings. That's why WikiRobot allows you to add bad sites to a blacklist. This way you can exclude them from your link building. "Today we see a new player in the arena of bots that target wikis for backlinks. And what a strong entry it makes!" It's fast. I didn't even use it at the max number of threads but it ran through a list of 1000s of wikis without any issues in no time. It's rock solid. When reviewing products I try to find weak spots that should be fixed before I give my approval. Couldn't find any here. The bot didn't crash or left me staring at the screen with nothing happening. It's feature rich. Everything you need to manage your campaigns and wikilists is provided for.I tested the bot with the wikis from the Wikibase that is offered for a small monthly fee. Success rate with an immediate submission and a scheduled submission was great. The scheduler works as advertised. When the bot isn't running at the scheduled time it will catch up once started again. Every step can be scheduled. Account creation, account verification, posting and link checking. I also loaded a list of 1000s of wikis that I scraped. It was a "raw" list because I wanted to know how the bot would handle it. The bot filtered the dead sites, gave me the platforms and PR without problems. Success rate with imported list will of course depend on the quality of the list. For a hassle free solution that gives a high success rate the Wikibase subscription is the obvious choice. "Great work on it, keep it up :)"
"A massive thumbs up to Wiki Robot"
Just wanted to give a massive thumbs up to Wiki Robot. I have all the other wiki submitters and to be honest wasn't really expecting a big difference. However I was wrong. The interface is fantastic and much easier to organize all your campaigns and the scheduler is super simple. The other thing I must mention is the speed which is phenomenal. If you are looking for your first wiki submitter then I can highly recommend this one and even if like me you already have the rest, give it a shot, I am sure you will be pleasantly surprised. "If you need Wikis this is the software for you!" I have been using WikiRobot since it was still in Beta since I think Sept 2012. They Listened to improvements and implemented them. If you need Wikis this is the software for you! Don't forget the trial test. "There is no other tool comparable to it, no competition!" I'm currently testing 15000 wikis I had in my old archive, 200 threads 10/15% CPU usage... I'm shocked... PR check 17% CPU usage... not bad at all, considering that I have 2 proxy scrapers working in the same moment (30 threads each). WikiRobot works well and it's fast... There is no other tool comparable to it, no competition! "It's my favorite wiki poster right now"
I just bought this. It's my favorite wiki poster right now... fast and easy. Nice combo. Backup System Everything is stored in a local database instantaneously. If WikiRobot crashes, you’ll have all your data saved to the point of crash. Nothing is stored anywhere and you lose all your precious data. 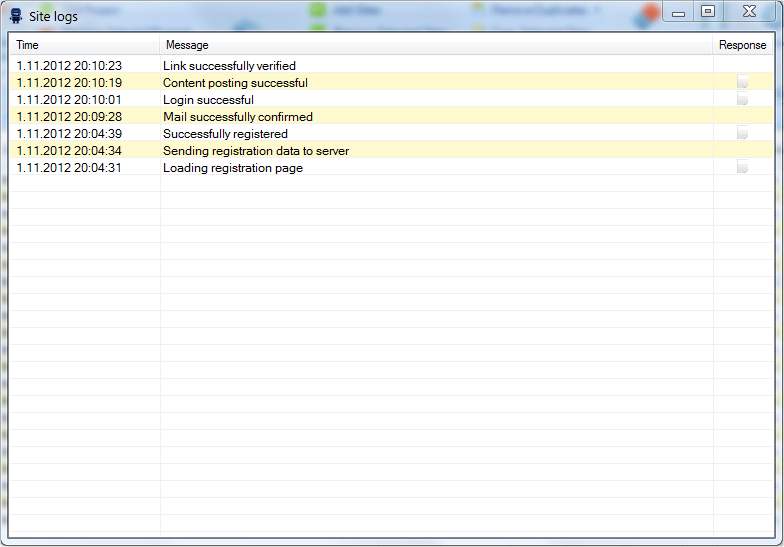 Scheduled Submission A very powerful and flexible scheduler with support for task chaining and delay between tasks. No scheduler or very poor and limited implementation with just a few options. 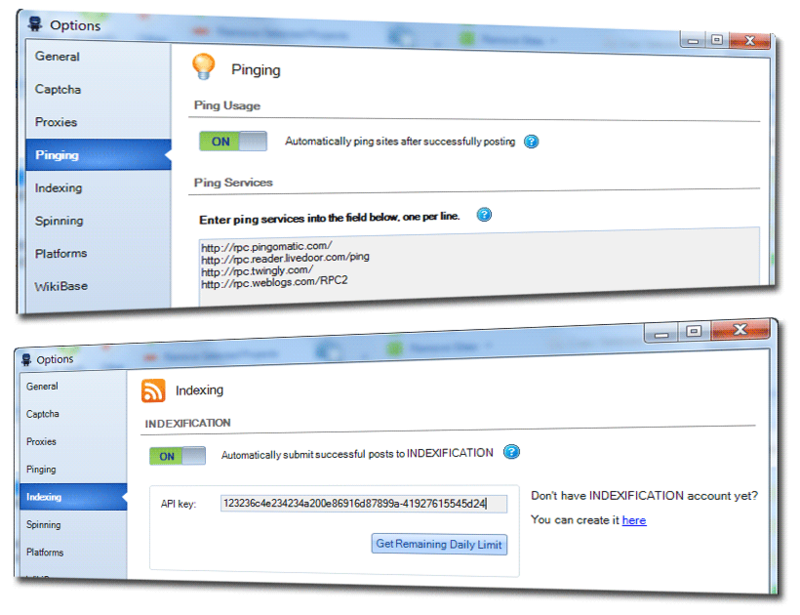 Additional Useful Features Dead sites removal, duplicate sites (based on url / domain) removal, PR & DoFollow checking, etc. Just core functionality without any useful tools. 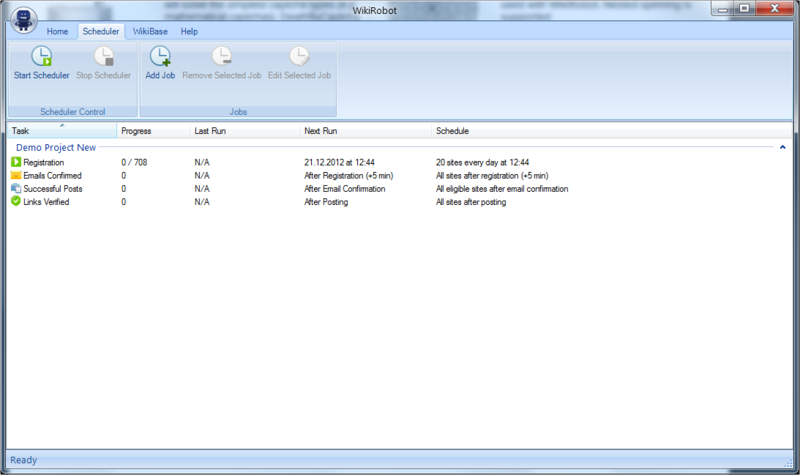 Customizability And Flexibility Lots and lots of settings to tailor WikiRobot to your needs. Very limited set of options without much flexibility. User Interface Beautiful, functional and intuitive interface. Clumsy, oversimplified or unintuitive user interface. Speed WikiRobot allows up to 200 simultaneous threads. Usually limited to 50 or less threads. Wiki Sites Database Access to WikiBase – constantly updated, fresh and tested database of wiki sites. * No wiki sites at all, or very poorly managed list (updated once a month or so). * WikiBase access is available for a very low monthly (6 months) fee. Absolutely! We believe in our product and know that users usually want to test the software before purchasing it. More about our free trial. WikiRobot is a Windows application (Windows XP SP3, Windows 2000, Windows 2003, Windows 7, Windows 8 are supported) and .NET 4 framework needs to be installed. It will run on other operating systems with virtualization software like VMware or Parallels but we can't guarantee it will work the way it was meant to work. As per hardware requirements - WikiRobot is very flexible because number of threads of virtually any action can be adjusted. That means that WikiRobot will also run on slower computers and internet connection (of course it will run slower than on fast computers with fast internet connection). We however do recommend that your computer has at least 2GB of memory if you are planning on working with larger (50.000+) wiki sites lists. WikiRobot is sold through JVZoo which supports all major credit and debit cards and of course Paypal. WikiRobot is a single PC license, so only one. You can however transfer your license once per month for free in case you get a new PC or reformat Windows by contacting us here. WikiBase is our complementary product - a huuuuugeeee database of working and postable wiki sites. We have our scrapers and bots running 24/7 to find and test as many wiki sites as possible for you to enjoy. Users typically get a very high success rate with WikiBase when WikiRobot is used properly. We've decided to go this route since many of our users don't have the knowledge, resources or time to build their own lists. WikiBase is exclusively available to WikiRobot users and is directly integrated into WikiRobot (it can be accessed only through WikiRobot!). Note that WikiBase is a subscription and comes with a monthly / 6 months fee and is completely optional. Number of sites is constantly changing as we keep updating WikiBase. For details about sites count, platform, pagerank, whether they're do-follow and whether captcha is present please visit WikiBase Breakdown. Of course. You can cancel any time you want and we won't bill you anymore. Here's Our Extra Mile: BONUSES! WikiRobot license is a one-time payment and is valid forever. What are you waiting for? Instant software download! Additional WikiRobot licenses are available by request at $47 per license. 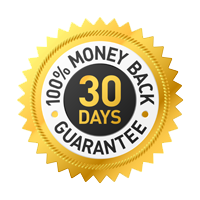 If you are not 100% satisfied with WikiRobot in the first 30 days, we'll refund you your full purchase (note that there are no refunds for WikiBase once you download it). No questions asked and no risk for you! Not ready to buy WikiRobot just yet? Want to take it for a ride first? No problem, you can try WikiRobot for 5 days for FREE! Note that only 1 project with up to 500 wiki sites can be added in the free trial. 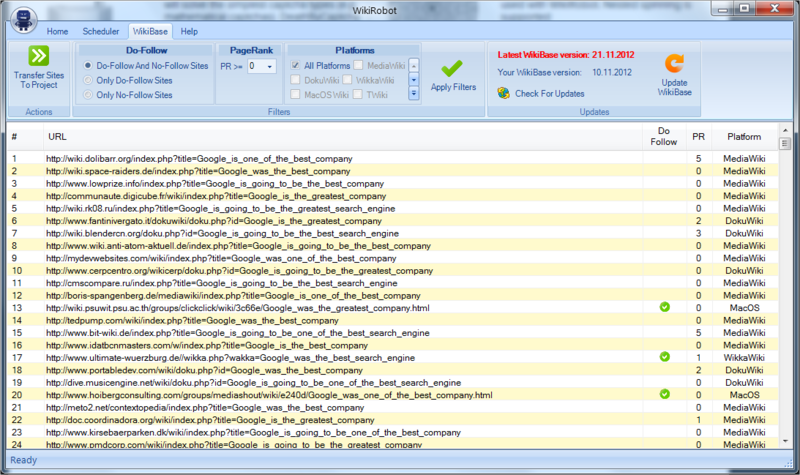 Also WikiBase in trial version contains only 100 demo sites as opposed to thousands of wiki sites in purchased WikiBase. There are no other limitations to free trial and all other features are present as in the licensed version.